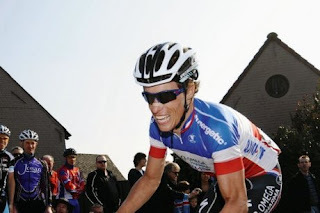 Sylvain Chavanel has been looking stronger and stronger over the past few weeks. Today, he just took De Panne with a killer TT. With the once again seemingly dominant Quick Step classics armada around him, a tricoleur jersey on his back and the frustration of last year's nearly weighing on his mind... I'm thinking maybe this Sunday might finally be his day. The scenario? With all eyes on a Tommeke bound in a straight jacket likely strapped tighter than the belts of JetBlue passenger-posse holding down a flipped-out pilot, Patrick Lefevere will play his French ace. Not that many French riders have won the Ronde van Vlaanderen. Three to be exact. Most recently Jacky Durand survived a day-long break to take the Ronde solo in 1992. Before that, there was Jean Forestier in 1956, now the oldest living winner of the Ronde. But the year before, 1955 saw Louison Bobet win a battle of giants to become the first French winner. Where have all the Juniors gone? 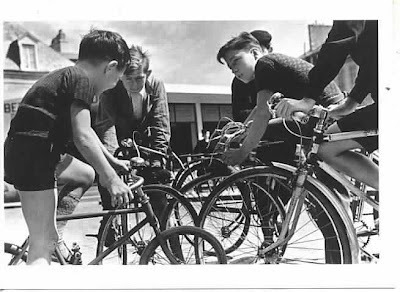 You'd think that after over a decade of American Tour de France victories, a road bike marketing explosion, and all the cycling video and content you can digest at the click of a mouse, that young guys would be eating the sport up, and lining up in droves. Sadly, not the case. Why? Well, there's a lot of reasons cited, none of which fully explain it, but all likely contribute in some way. There are some bright spots though. Read that California High School mountain bike leagues are booming. That's very cool. But still I wonder... where are the road racing juniors? Case in point: Here a benchmark: A snapshot of Junior road racing available to teenage hopefuls in New England this year. Photo of the day: Style. A great shot of time trial perfection: A neo-pro named Stephen Roche, 1981. Exploding onto the scene with victories in Tour of Sardinia and Paris-Nice. Stylistic perfection contre-le-montre. This was a Miroir du Cyclisme poster that an old teammate and friend Embo mounted and gave me for Christmas later that year. Kept it all these years. In fact, it's hanging in my workshop/basement. It's a study in cycling style. Upper body still and relaxed all the power coming from silky-smooth, fluid pedalling, legs clicking over like a metronome. 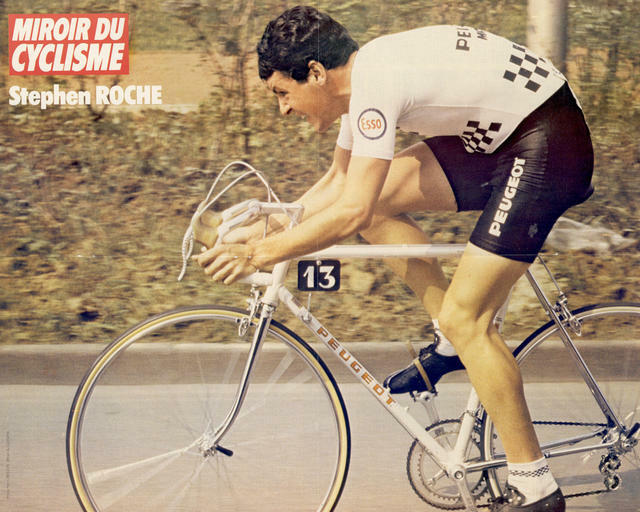 Roche's form is an icon of purity from a time when timetrials were about stripped-down minimalism: Lighter wheels. Skinsuit. No gloves, no helmet, no glasses. Aerodynamics then meant holding your 'oeuf' position in the drops. More retro. 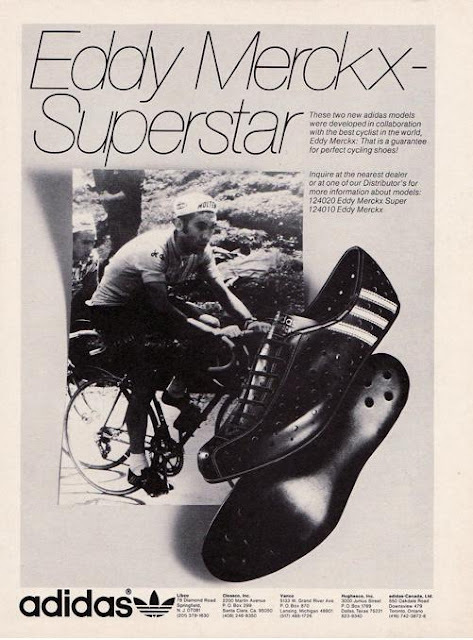 Back in '77, this was one of the shoes you very likely wore. Most guys used Detto Pietro, Adidas or Puma then. A rare few had Sidi's, or 'Colnago'. All were black, leather, and you needed to polish them all the time to keep the uppers soft and shiny. Even back then, dirty shoes were not very 'pro'. You needed a shiny gleam to match that patent leather strap helmet. 'That's what we're talkin 'bout'.